I will start mixing up blood orange margaritas of my own pretty soon and drink them on a regular basis throughout the summer. This is a small way that I celebrate the season. 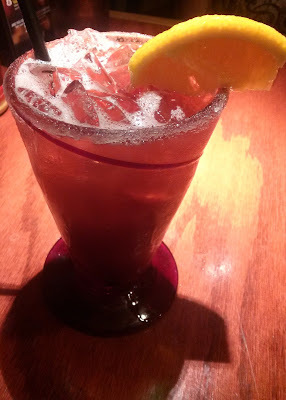 My parents are out of town and the evening before they left (and while my dad was returning from a business trip), my mom and I dined out at one of her favorite restaurants, Red Robin, which is a chain restaurant specializing in gourmet burgers located in Annapolis, Maryland. In addition to my burger and fries, I indulged in their Berry Blood Orange Margarita which was delicious. The berry flavor is actually both strawberry and blackberry. I discovered sweet blood orange juice in Italy. I think this is the second time I've had this particular drink. It was also a treat to eat out.